Ships tomorrow if you order in the next 16 hours 9 minutes. 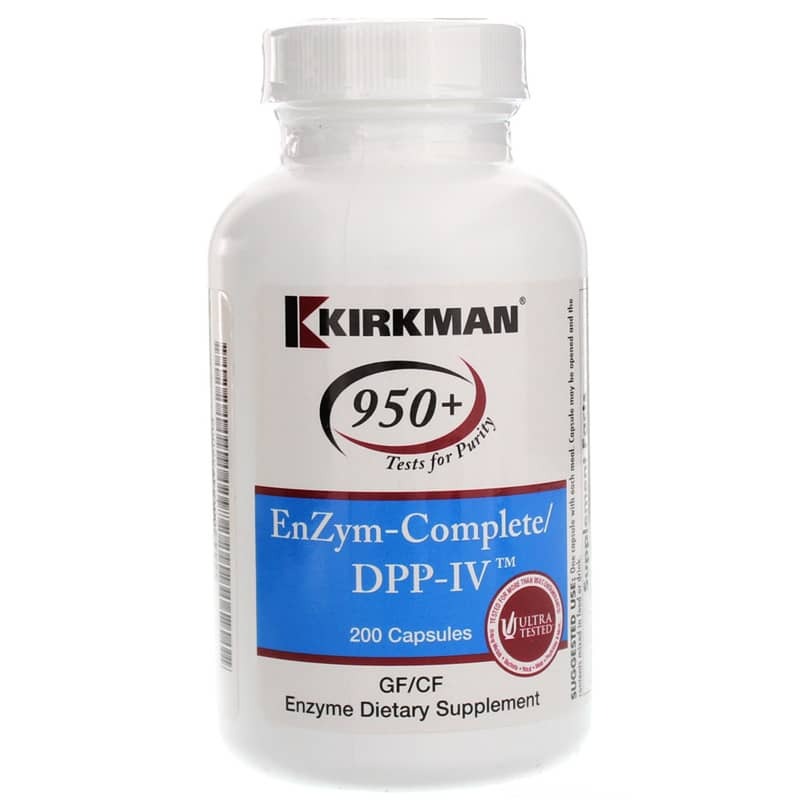 For professional-level digestive support for a wide range of foods, get EnZym-Complete/DPP-IV from Kirkman. 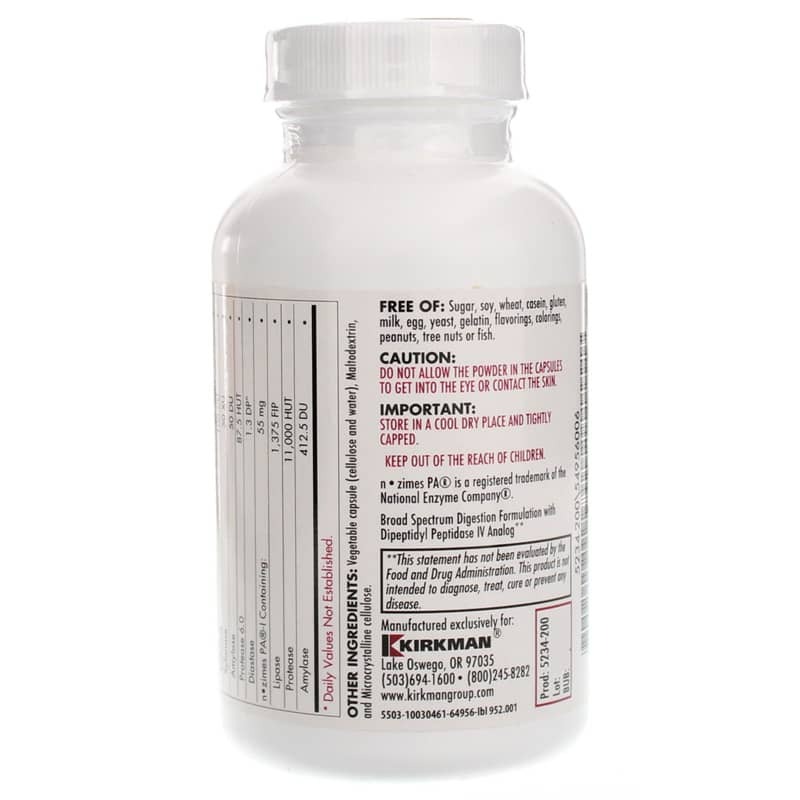 Part of Kirkman's line of professional supplements, EnZym-Complete/DPP-IV is Kirkman's highest strength, broad-spectrum digestive enzyme supplement. Containing a blend of 17 enzymes in casein- and gluten-free capsules, it's designed to provide support for digestion of a wide range of foods. 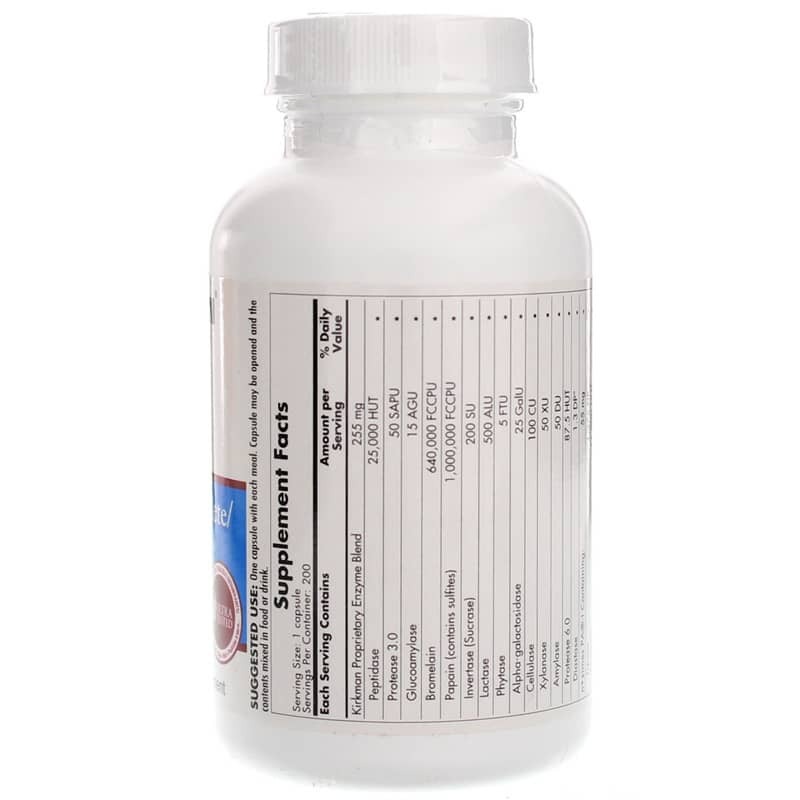 With a wide range of enzymes, including protease, bromelain, papain, lactase, amylase, cellulase and more, this professional supplement is designed to support the digestion of proteins, carbohydrates, fats, sugars and fiber under a wide range of pH conditions. For particular support for the digestion of wheat and dairy products, it even includes DPP-IV (dipeptidyl peptidase-IV) enzyme analog, which supports the body's ability to degrade peptides formed from exposure to casein and gluten. Working synergistically to support overall digestion, the combination of proteases, amylases, lipases, disaccharides and cellulases in EnZym-Complete/DPP-IV help to replace the enzymes lost in cooking. Kirkman's vegetable capsules are free of sugar, soy, wheat, casein, gluten, milk, egg, yeast, gelatin, flavoring, colorings, peanuts, tree nuts and fish. Get Kirkman's best digestive support. Order EnZym-Complete/DPP-IV today. Contains NO: Sugar, soy, wheat, casein, gluten, milk, egg, yeast, gelatin, flavorings, colorings, peanuts, tree nuts or fish. Adults: One capsule with each meal. Capsule may be opened and the contents mixed in food or drink. Do not allow the powder in the capsules to get into the eye or contact the skin. If you are pregnant or nursing, please consult your healthcare professional before using this product. Keep out of the reach of children.